Ah, January. When everyone is trying to be their best self and making resolutions. 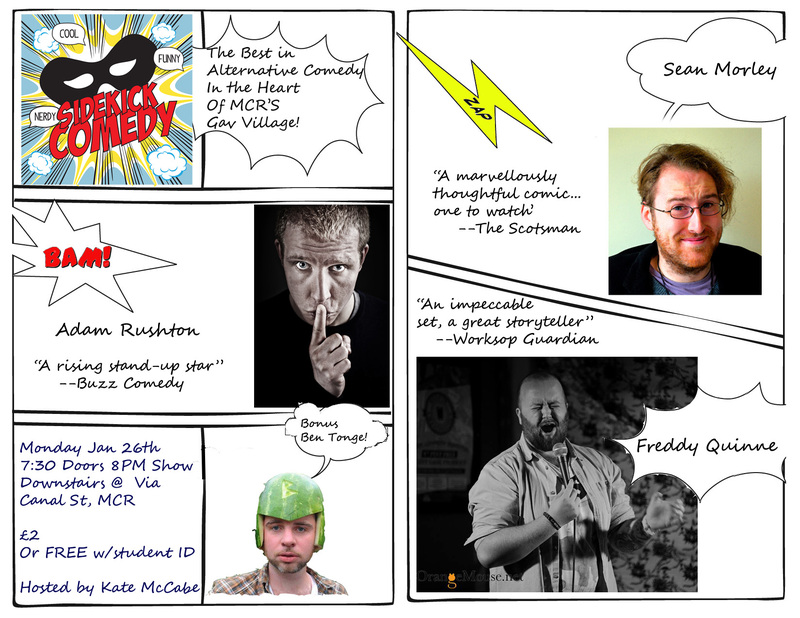 At Sidekick, we resolve to keep bringing you the best in alternative comedy…right in the heart of The Gay Village. With a line-up including: Adam Rushton, Freddy Quinne, Sean Morley & Ben Tonge, there will be something for everyone. Plus, compere Kate McCabe will have some fresh comic shop sale-shelf tat for one lucky winner in the audience. What will it be??? Come along to find out. 7:30 doors 8PM show, wrapping up by 10PM. £2 in or FREE with student card. This entry was tagged Adam Rushton, Ben Tonge, Canal Street, Comedy, Comedy in Manchester, Freddy Quinne, Kate McCabe, Sean Morley, The Gay Village, Via Fossa. Bookmark the permalink.